A Spanish 2 inch 17th-century frame, with a black carved twisted-rope motif all along a round top profile, and gilded stacked-floral decoration at the corner and center. The finish shown is polished black over yellow gold with distressing and a red clay. 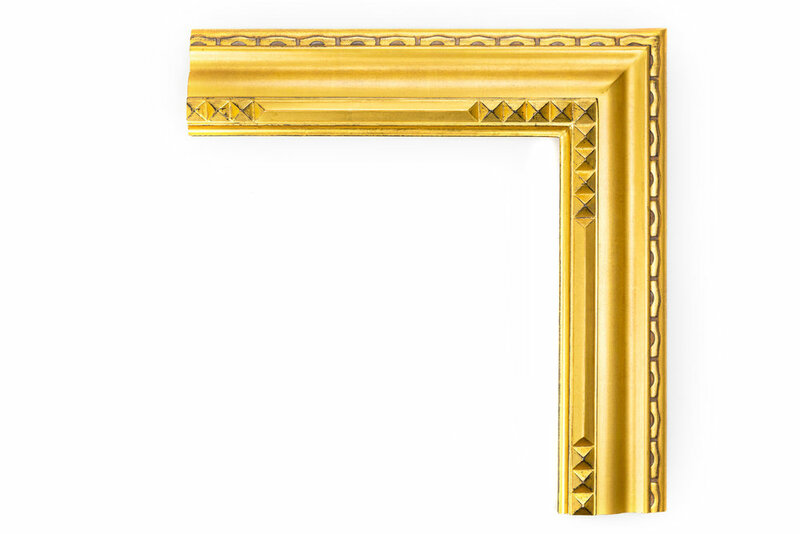 A Spanish 2-1/4 inch frame, with overlaid panel carving on the outer corner, with a separated black panel and a high-relief twisted rope decoration all along the inner edge. The finish shown is a black panel and yellow gold with a red clay. A Spanish 1-1/4 inch 17th-century frame, with high relief abstracted petal carvings all along the top edge and carvings along the black painted sides. The finish shown is black over yellow gold with heavy distressing and a red clay. A Spanish 3 inch 17th-century frame, with high relief gilded floral carvings at the corner & center, on a reverse scooped outer black panel with hand-tooling, and a tall inner lip of petal carving. The finish shown is black panel and yellow gold with an antique finish and red clay. A Spanish 3-1/2 inch 17th-century frame, with high relief gilded floral carvings at the corner & center on a raised center panel of patterned black, concentric oval outer carved patterns and inner leaf decoration. The finish shown is black panel and yellow gold with an antique finish and red clay. A Spanish 2 inch frame, with large continuous floral petal carving all along the frame surface, toned with red on the outer edge. The finish shown is red over yellow gold with an antique finish. 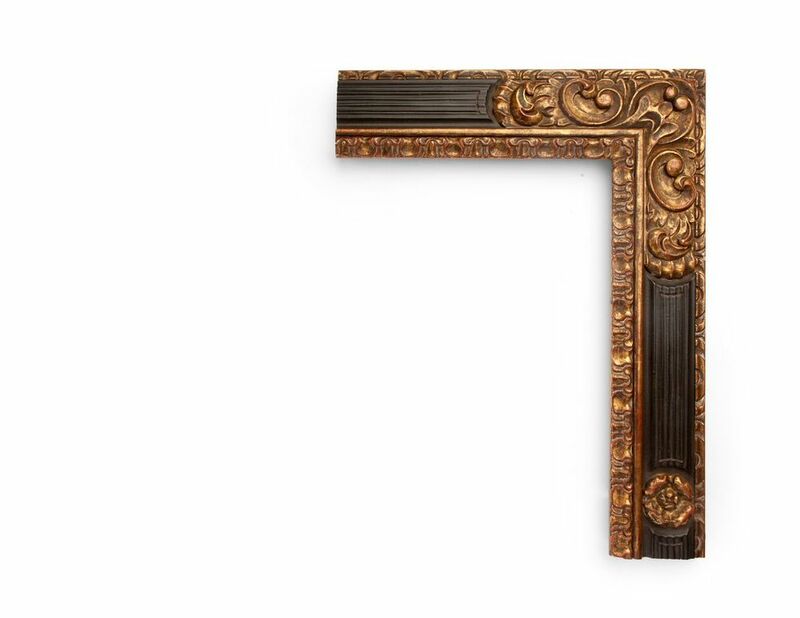 A Spanish 4 inch Baroque-style frame, with continuous carving throughout of overlaid ivy leaves. The finish shown is white gold with a black clay. A Spanish 4-1/4 inch frame, with high relief carved fleur-de-lis corner, stacked petal center, alternating floral carvings along a center panel, carved floral designs all along the high inner lip, and overlaid laurel patterns along the outer edge. The finish shown is an antiqued light blue over yellow gold with heavy distressing and a red clay. A Spanish 3 inch 17th-century frame, with gilded floral carved corners decorations on a flat toned panel, and concentric oval outer patterns and an inner carved lip of laurel decoration. 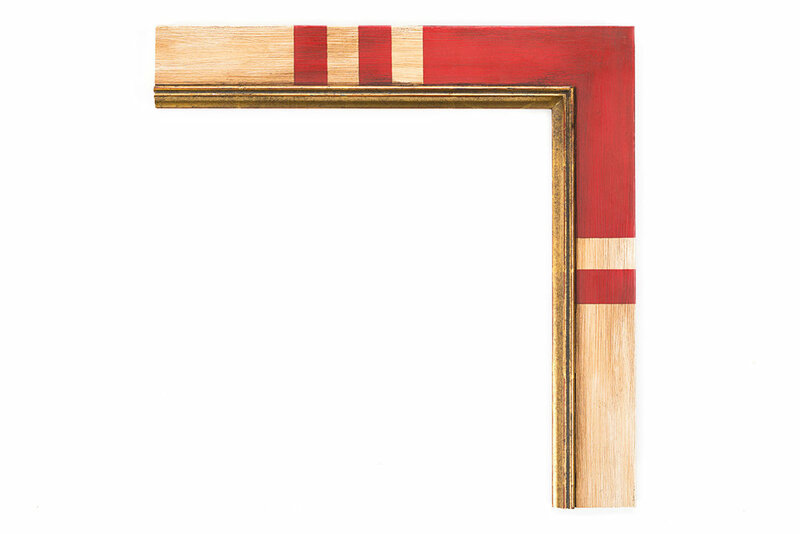 The finish shown is a red painted panel and distressed yellow gold, with a red clay. A Spanish 5-1/2 inch 17th-century frame, with high relief gilded floral carved decoration at the corner & center, on a black textured-gesso panel, concentric oval outer patterns and a tall inner lip of overlaid petal carving. The finish shown is black over red panel and yellow gold with a dark red clay. This is a small sample of our selection of Spanish frames. Come in to see more.